Since being persuaded to help with the proposed arts complex for King’s Stables Road I’ve come to understand gradually the world of developers and Edinburgh Council together with the arts community and general public’s response to development with or without an arts leaning. It is something that to be honest had passed me by previously but in a way that helped as I had no previous baggage of causes lost or words spoken. Then when at the last minute the development I was involved with lost the King’s Stables Road site to a developer clearly only interested in a hotel and student flats after all that had been said to me by Edinburg Council there was immediately a sense of injustice that I have to say so far hasn’t abated with time. I was drawn into a world of budget versus luxury or high-end quirky hotels. An arts community divided into many factions mostly, and many would say understandably, only interested in their own specific needs. Arts journalists rather than artists tend to look at “the big picture”. And Edinburgh Council were everything people complained about and more despite having an awful lot of good people working for them. I understood the retail problems but this was a whole new world. Consequently I crossed paths with Bruce Hare and Duddingston House Properties firstly over King’s Stables Road and then briefly when asking about the Odeon. What I have to say was Bruce Hare was the only developer I spoke to who took the arts complex idea for King’s Stable’s Road seriously and showed genuine enthusiam for what could be achieved. When I plucked up courage to ask what was happening with the Odeon he seemed determined that he would find somebody who would keep it as an entetainment venue. That has now recemtly proved to be the case. 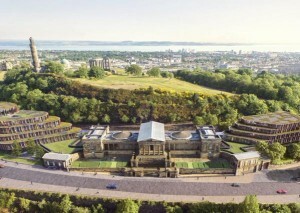 So I was more than surprised when I saw how the succesful bid to turn the Royal High School site into a world class hotel while saving and restoring the school was being portrayed. I was further confused when the Music School option appeared. I wasn’t an expert on these things but from what I had learned over King’s Stables Road the hotel bid had been successful against 50+ others so not only would the developers be given plenty of time to get planning but also should they eventually fail there would be other developers waiting in the wings with far more rights than the Music School. Those behind the Music School were clearly well versed in planning matters so I just assumed there was something I had missed. Then a couple of days ago there was a statement from the hotel developers confirming all I had thought. Clearly the best thing to do now was accept there was going to be a hotel and come together to make the very best of the massive opportunity there was for the Royal High School itself to become a centre for the arts. Alas no. The response was to start a petition. You do start to get the feeling that there is a small group of well educated, arts and heritage orientated people who I suspect could afford to stay in the proposed six star hotel who think they know what is best for the rest of us. The building has been empty and allowed to get into disrepair for almost 50 years and what is needed as soon as possible is something to happen and not a campaign to stop things happening. When Edinburgh Council asked me to get involved with the developers looking at King’s Stables Road they made it clear they were fed up with being promised arts facilities that once the proposed hotels and flats had been built never materialised. That obviously made it all the more galling when the preferred bid was one that clearly would follow that pattern. Even now they have no plan beyond dedicating two floors of a five storey building to “the arts” and their planning application is due this month. On the other hand there is no doubt about Bruce Hare’s enthusiasm for the arts and Rosewood the hotel operator has a track record that speaks for itself. I don’t think anybody thinks the hotel wings are perfect but they are the best solution given all the constraints and opinions that had to be cosidered. In particular from what I have read the number of rooms and therefore the size of the wings was determined by the land owner and the look was determined by those wanting something that “blended in” more than more orthodox buildings. So there is an opportunity to restore the iconic Royal High School to its former glory and make it a centre for the arts with a financial backing much needed in these days of so many cuts. I’ve been told (because I asked) there will be three venues catering for betwen 65 to 375 people always available to the public. The school itself will be a public facility but at no cost to the public and in fact the financial burden of trying to look after such an old building will be removed. Hundreds of jobs will be created and local businesses in particular will benefit from the custom of both the hotel and its patrons. On the downside if you find the right spot and look at the right angle it won’t look like it was meant to in the 19th century. Having recently visited Calton Hill and searched out the views to Calton Hill the reality is far removed from the idealistic picture so eloquently espoused by some. Going by the surveys the hotel already has the support of the general public just not the heritage activists and the more vocal arts community. Taylor Swift might indeed choose to stay at Rosewood Edinburgh and in her immortal words the “haters gonna hate” but it is time for the rest of us to get behind an idea that is good for the arts, good for the tax payer and a real boost to both the Edinburgh and Scottish economies.